LED Type: 48pcs 3W High Power LEDs. Core coverage for any high lighting required SPS tank 26"x18" and 2. Regular coverage 32"x24" for mixed. Channel One: 8x 470nm, 16x 450nm. Channel Tow: 6x 420nm, 2x 520nm, 2x 660nm, 6x 10000K, 8x12000K. Operating Temperature: 90-110 (32.2-43.3). Thermal Management: 2x 80mm dual bearing cooling fans. Product Dimensions: 16" x 10.4" x 1.6 (40cm x 26cm x 4cm). Product Weight: 5Lbs(2.27Kgs). Mount: Horizontal-Retractable Brackets & Hanging Kits. 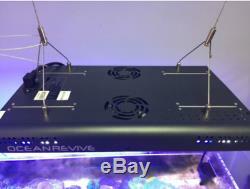 OceanRevive® Arctic-T247 Aquarium LED unit is ideal for aquatic habitat, aquatic ecosystems and marine organisms, specialized for SPS/LPS/Soft corals and reef fish. Built-in controller controls TWO channels independently (blue and full spectrum channels) for both Time and Intensity. 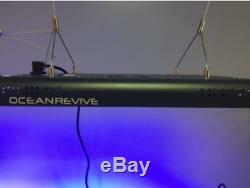 OceanRevive® Arctic-T247 and the support services earned numerous positive reviews and reputation on the popular reefing forums Reef2Reef, ReefCentral, Nano-Reef, etc. Special Full Spectrum layout is developed by fellow reefers of the international reefing community: Royal Blue 450nm, Blue 470nm, Cool White 10000K, 12000K, Red 520nm, Green 660nm and UV 420nm, creating the natural reefing light to reflect vivid color from the corals and fish. Using 90 degree optics helps penetrate the depth of water. It comes with both supporting brackets and hanging kits to fit any type of fish tank. Specifically designed to expand the coverage on depth and width. The item "NEW Ocean Revive ARTIC-T247-B 120W LED Aquarium Lights" is in sale since Tuesday, January 02, 2018. This item is in the category "Pet Supplies\Fish & Aquariums\Lighting & Bulbs". The seller is "antthaht-0" and is located in Tampere. This item can be shipped worldwide.